Mogao Caves - Also known as the Caves of the Thousand Buddhas, they're a series of Buddhist grottoes located in the Ganshu Province near Dunhuang. 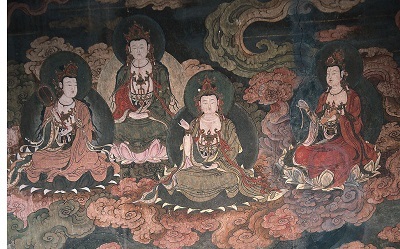 They are the most famous of three major cave systems in China which contain Buddhist art; the other two being the Longmen and Yungang Grottoes. A total of 492 sanctuaries have been fashioned throughout the extensive caves, each which house paintings and statues whose origins span a thousand years. Legend says that a Buddhist monk named, Lè Sūn, stumbled upon the caves in 366 and a vision of a thousand Buddhas bathed in golden light inspired him to begin the transformation of it into a temple. Dunhuang, at the time, was a very important stop along the Silk Road, where travelers could find rest on the edge of the Gobi Desert and restock their supplies. Before that, it was a military outpost founded in the late second century B.C. by Emperor Wudi (see Liu Che) to guard against invasions by the Xiongnu. The earliest surviving account about the history of the caves comes from a book called Fokan Ji (Buddhist Shrines) dating from the Tang Dynasty around the time of Empress Wu (see Wu Zetian). In the time that followed, more monks arrived and continued to add to it, eventually attracting Buddhist pilgrims as well. Today it is one of China's biggest tourist attractions and with some 2,000 sculptures, the caves contain a wealth of historical, cultural and religious information.